Sunday, October 21st, is the last in the series of Hallmark Channel‘s Fall Harvest movies. The last one is featured on Hallmark Movies & Mysteries. Good Witch: Tale of Two Hearts stars Catherine Bell, James Denton, and Bailee Madison. In the movie, Middleton’s favorite couple, Cassie (Catherine Bell) and Sam (James Denton) are planning the Halloween Harvest Festival when a 100-carat ruby known as “The Heart of Middleton” is stolen from the museum where the gala festival is to be held. Who is the culprit? Will the ruby be found? Whose heart is broken? Watch and see if it all magically works out tonight at 8 pm/7c. 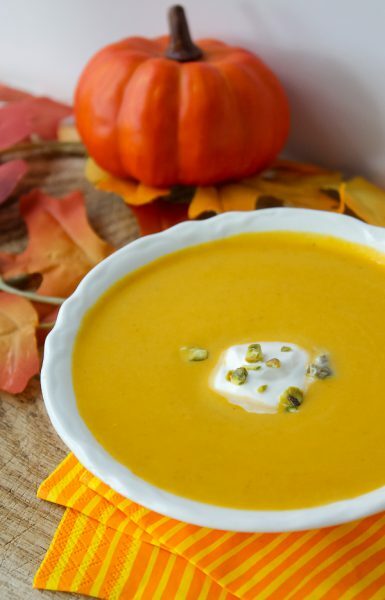 Since pumpkins are a huge part of Halloween, I thought a good recipe for this movie would be a creamy and festive pumpkin soup. This delicious soup has spices like curry powder, nutmeg, and ginger to give it a special flavor. It’s so easy to make and enjoy for a Halloween meal. I think the Good Witch would approve! Melt the butter in a medium soup pot. Add onions and leek, stirring occasionally until softened. Stir in all remaining ingredients except for the half-and-half and garnishes. Bring to a boil, lower heat, and simmer for 15 minutes, stirring occasionally. Remove bay leaf and discard. Let soup cool slightly then place in a blender and puree until smooth. Return puree to the soup pot and stir in the half-and-half. Heat over medium-low heat until very hot. Taste and adjust for seasonings. 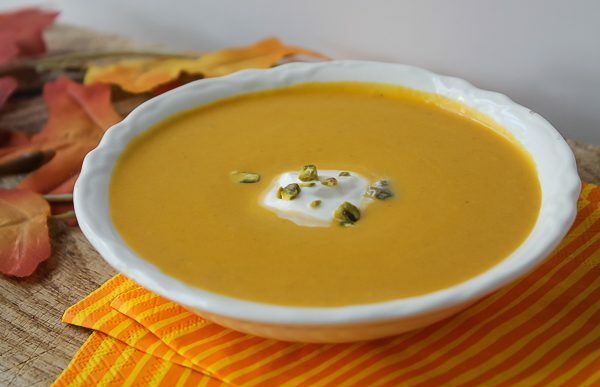 Serve soup garnished with a dollop of sour cream and a sprinkling of pumpkin seeds or chopped pistachio nuts, if desired. Serves 6-8. Yum! Sounds and looks delicious. Love the spices. Will have to try it. 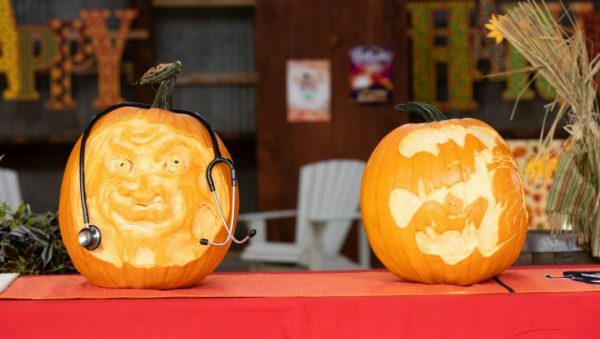 And have a Spooktacular Halloween!